North out of North Bingham on the only road,.5 mi to a Y. At the Y, bear right onto Cemetery Road. Cemetery is.25 mi. The earliest birth date in our Potter County cemeteries lists is in this cemetery: Benjamin Van Campen. Dr. Van Campen died on 11-26-1831 at the age of 77y 5m 22d. His calculated birth date is 6-4-1754. ALLEN, Joshua L. Spouse of Lori G. Born 2-18-1982, died 1-30-2008. Age: 25 - Son of Roy and Sonya (Garis) Allen. Born in Hornell, NY. Wed 8-17-2002 in Wellsville NY, 3 children. Killed in car accident. BACON, Beverly J. (Adams). Spouse of Maynard W. Born 1-1-1931, died 9-21-2017. Age: 86 - Dau of Albert and Oralie (Otto) Adams. Born and died in Olean NY, lived in Bingham Twp. Dairy farmer with husband. Wed 3-19-1955 in Olean, two children. BACON, Maynard W. Spouse of Beverly Adams. Born 6-11-1919, died 5-4-2000. Age: 80 - Son of Zera L. and Leah (Spencer) Bacon. Born in Bingham Twp PA. Dairy farmer in Bingham Twp PA. Wed 3-19-1955 in Olean, two children. BAILEY, Edward W. Spouse of Cheryl L. Born 7-14-1950, died 3-6-2006. Age: 55 - Son of Floyd E. and Hazel J. (Bean) Bailey. Wed 6-5-2004. BAILEY, Floyd E. Spouse of Hazel J. Bean. Born 1911, died 1980 - Wed 6-4-1949 in North Bingham, 3 children. BAILEY, Hazel J. (Bean). Spouse of Floyd E. Born 8-21-1921, died 12-21-2003. Age: 82 - Dau of Edward and Almyra (Payne) Bean, born in North Bingham. Wed 6-4-1949 in North Bingham, 3 children. BARNES, Hiram. Spouse of Catherine Cauly. Born 1819, died 01-15-1877. Age: 58 - (1850 Bingham Census) - Civil War Vet, Co ? 53, Reg. PA Vol. BARTOO, Philip R. Spouse of Marlene Griswold. Born 5-26-1964, died 1-29-2011. Age: 46 - Son of Duane and Patricia (Covert) Bartoo. Wed 5-14-1994 in Wellsville NY. BEAN, Minnie E. Born ? ?, died ?? BLANCHARD, Stephen. Born 1836*, died 3-15-1895. Age: 59 - (1880 Bingham Census) - Civil War Vet, Co. C 1st Pa. Light. Art. BRIGGS, Gracye. Spouse of M. Grant. Born 1891, died 1945 - Five children. BRIGGS, M. Grant. Spouse of Gracye. Born 1878, died 1965 - Son of Rev. Asahel and Sarah (Potter) Briggs. BRIGGS, Mary E. (Fuss) Seely. Spouse of ? Seely/ Gary G. Briggs. Born 12-4-1944, died 3-9-2015. Age: 70 - Dau of Carl and Lucille (Smith) Fuss, born in Salamanca NY, died in Genesee PA. Killed in a house fire with her husband, Gary. One son surnamed Seely. Wed Gary 8-6-1983 in Genesee PA. A teacher for over 35 yrs. BRIGGS, Sarah M. (Potter). Spouse of Rev Ashel. Born 1-25-1843, died 3-08-1894 - Dau of John and Thankful Potter. Born in Independence NY. Wed 7-3-1858. BRIGGS, Susan (Howe). Spouse of Martin D. Born 8-16-1824, died 1902 - [His Wife] Dau of Isaac and Betsey (Buck) Howe. Wed 7-4-1843. CAMPBELL, Elizabeth. Spouse of Oliver. Born 1820, died ?? CAMPIN, Van, Dr. Born ? ?, died ?? 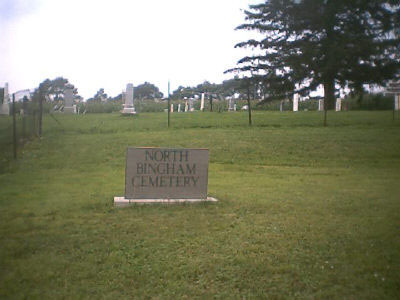 - Second person buried in this cemetery. CARPENTER, Dora H. Born 6-1898, died 198? - Son of Eugene A. and Ella J. Carpenter. 1900 Bingham Census: Dor is male. CARPENTER, Ira B. Spouse of Mary A. Baldwin. Born 3-27-1823, died aft 1890 - Son of Barber and Elinor (Bronson) Carpenter. Wed 9-8-1845. Justice of the peace for 24 years. (1860 Bingham Census) - Civil War Vet, Co D 58th PA Vol, Pvt. CARPENTER, Leah D. (Outman). Spouse of Floyd S. Born 1882, died 1915 - Dau of Jonah A. and Malissa Outman. CARPENTER, Theodorus. Spouse of Charity Cuatt. Born 12-18-1802*, died 07-31-1859. Age: 56y 7m 13d - Son of Barber and Elinor (Bronson) Carpenter. Native of Tompkins Co NY. Settled in Binghan Twp abt 1829. 12 children. CHESTNUT, John S. [Uncle John]. Spouse of ?. Born 1833, died 06-02-1899 - Son of James and Eleanor Chestnut. "Survived by his wife and 7 children." (1850 Bingham Census; Spelled Chesnut) - Civil War Vet, Co K 149th PA Vols, Pvt. Captured at Gettysburg, Pa. on July 1, 1863 - mustered out with company on June 24, 1865. CLARK, Blanche (Hauber). Spouse of Frederick. Born 06-02-1869, died 10-27-1963 - Dau of David T. And Eugertha (Chapin) Hauber. CLARK, Gertrude Alice (Neefe). Spouse of Addison H. Born 3-31-1910, died 1986 - Dau of Clarence H. and Evva (Miller) Neefe. Addison diedn in 1970. CLARK, Jennie A. (Grover). Spouse of William J. Born 1858, died 1923 - [His wife] Dau of Charles and Eliza L. (Raymond) Grover. Wed 3-24-1881. CLARK, May Emma (Barnhart) [Emma]. Spouse of Milton. Born ? ?, died ?? - Wed 12-31-1877 in Ulysses. CLARK, Milton. Spouse of May E. Barnhart. Born 1838, died uncut - Wed 12-31-1877 in Ulysses. CLARK, William J. Spouse of Jennie A. Grover. Born 1858, died 11-17-1939 - Son of Addison and Martha M (Chestnut) Clark. Wed 3-24-1881. Survived by 3 dau, 2 sons. CLARKE, Eleanor (Kibbe). Spouse of Joseph C. Born 1931, died ?? - Wed 3-11-1956. CORNELL, Norma J. (Hamilton). Spouse of Charles M. Born 1-31-1955, died ?? CROWELL, Mary Elizabeth (Howe). Spouse of Adelbert C. Born 5-6-1929, died 6-22-2018. Age: 89 - Dau of Lavern B. and Viola (Teater) Howe. Born, lived and died in Potter Co. Was secretary in husband's CPA firm for 40 years. Three children. FLYNN, Carol L. (Weiss). Spouse of Mark P. Born 5-28-1942, died 11-7-2016. Age: 74 - Dau of Edward J. and Violet (Hogancamp) Weiss. Born in North Bingham PA, lived in Elkland PA, died in Elmira NY. Wed 12-9-1967, four children. FOWLER, Nealen N. Born 9-1894, died 10-4-1918 - [Son] Son of William B. and Myrtle M. Fowler. (1900 Bingham Census) - WW I, Died of Influenza. FRY, Betty M. (Bunnell). Spouse of Cecil L. Born 1002301924, died 10-1-2009. Age: 84 - Dau of Willard and Lillian (Snyder) Bunnell. Wed 12-14-1946 in Genesee PA, 7 children. FRY, Cecil LeRoy [Roy]. Spouse of Betty Bunnel. Born 9-11-1914, died 11-17-2004. Age: 90 - Son of Alvin Fry and Flossie Boylen. Born in Jamestown, PA. Wed 12-14-1946 in Genesee PA, 7 children. FULLER, Ezra Lewis. Spouse of Electa J Cotton. Born 1842, died 1884 - 10 children. - Civil War Vet, Co D 53rd PA Vols, Pvt. FULLER, Harden D. Companion of Dale Osterhout. Born 1861, died 1902 ColG - Dau of Larry E. and Marion (Brimmer) Seeley, born in Coudersport PA, died in Troy PA. Five sons, surnamed Gleason, Davis, and Osterhout. GROVER, Clarence M. Spouse of Alberta Outman. Born 7-11-1921, died 12-10-2017. Age: 96 - Son of C. Wilbur and Ina (Grover) Grover. Born and lived in Genesee PA, died in Coudersport PA. Worked 32 years for Dresser-Rand. Wed 6-15-1946 in Wellsville NY, one daughter. (Spouse survives) - WW II Vet, US Army. 1942-1945, Europe 1950-1952 Panama Canal Zone. GROVER, Ira Parker. Spouse of Sarah A. Born 1832, died 1919 - Living with Benjamin R. and Lorinda Grover in 1850 Bingham census. GROVER, Levi L. Spouse of Ruth E. Main. Born 10-9-1919, died 5-13-1993 - Wed 3-18-1942 in Harrison Valley, eleven children - WW II Vet, US Army, Sgt. GROVER, Marshall R. Spouse of Cynthia Hurd. Born 12-1841, died 1918 - Son of Benjamin L. and Weltha (Robbins) Grover. (1850, 1900 Bingham Census) - Civil War Vet, Co D, 53rd PA Vols, Pvt. Prisoner at Libby, Belle Isle, and Salsbury. Discharged on Surgeon's certificate on June 7, 1865. HALL, Onnolee (Truax). Spouse of Stewart G. Born 1-3-1925, died 8-26-2000. Age: 75 - Dau of Stephen and Elsie (Robbins) Truax. Wed 5-18-1946 in St. Mary's PA. Co-owner/operator Hall's General Store in North Bingham, PA, also Post Mistress. HAND, Mark D. Born 10-1-1968, died 4-16-2018. Age: 49 - Son of Carlton L. and Reha [Betty] (Mahnke) Hand. Unmarried. HART, William Mix. Spouse of Mary A. Langdon/ Mrs. Elizabeth Smith. Born 10-24-1824, died 5-8-1909 - Born in CT, a farmer. (1880 Bingham Census: Wed Mary in 1849, 5 children. Wed Elizabeth in 1893. (1900 census: Wed 6 yrs to Elizabeth.) - Civil War Vet, Co D, 58th PA Vols, Pvt. Drafted - discharged by General Order on June 13, 1865. HARVEY, Howard G. Born 2-23-1911, died 12-13-1972 - WW II Vet, TEC 5 734 Ord - Lt, Maint. HAUBER, David Thatcher. Spouse of Eugertha Chapin. Born 11-29-1835, died 6-26-1915 - Son of John and Jane Hauber. Born in Rexville NY. Wed in 1865. (1880, 1900 Bingham Census) - Civil War Vet, Co H, 141 NY Vols, Sgt. HAUBER, Fayette Willard. Spouse of Elizabeth L./ Thetis Sheldon. Born 1911, died 1993 - Two children with Elizabeth. HAUBER, Giles Chapin. Spouse of Lottie L. Briggs. Born 1882, died 1961 - Son of David T. And Eugertha (Chapin) Hauber. Born in PA. Wed 12-4-1907. HOLBERT, Clinton S. Spouse of Mabel Bartoo. Born 8-1886, died 1923 - Son of John H. and Mabel (Bartoo) Holbert. (1900 Bingham Census) Wed 05-10-1916. HOLBERT, Mabel (Bartoo). Spouse of Clinton S. Born 11-03-1893, died 4-24-1989 - Dau of Henry and Clara (Grover) Bartoo. Wed 05-10-1916. HOLBERT, Milford. Spouse of Not named. Born 10-20-1920, died 3-19-2005. Age: 84 - Son of Clinton S and Mabel (Bartoo) Holbert. Born in Bingham Center, a farmer. HOLBERT, Mulford. Spouse of Carrie. Born ? ?, died ?? HOWE, Albert Durand. Spouse of Carrie E. Case. Born 4-21-1855, died 5-28-1928 - Son of William N. and Louisa (Dyer) Howe, born in Independence NY. HOWE, Caroline L. (Ainsworth). Spouse of Rufus H. Born 08-16-1826, died 02-06-1854 - [wife of] Dau of Herman and Betsey (Lewis) Ainsworth. Born in Independence, Tompkins Co, NY. HOWE, Carrie E. (Case). Spouse of Albert Durand. Born 1852, died 1950 - Wed 5-15-1881 at Sullivan PA.
HOWE, Clinton E. Born 4-30-1851, died 12-02-1872. Age: 21y 7m 2d - Son of Rufus H. and Caroline (Ainsworth) Howe. HOWE, Daniel Colton. Spouse of Mary M. Smith. Born 7-28-1818, died 12-24-1878 - Son of Timothy and Flavia (Colton) Howe. Wed 5-23-1840 in North Bingham. HOWE, Ella Estelle (Daniels). Spouse of Lavern B., Sr. Born 11-20-1858, died 9-29-1889 - Dau of Joseph W. and Iliza J. (Bassett) Daniels, born in Ulysses. Wed 4-14-1880. HOWE, Flavia (Colton). Spouse of Timothy. Born 7-29-1792*, died 12-24-1878. Age: 86y 4m 26d - Dau of Reuben and Rodda Colton. Wed 1-2-1817 in Lansing, Tompkins Co. NY. HOWE, Hattie Azuba (Bassett). Spouse of Louis F. Born 12-29-1887, died 9-25-1948 - Dau of William A. and Orela (Seeley) Bassett, born in Ulysses. Wed 2-22-1907 in Ulysses, 4 children. HOWE, Herrick L. Spouse of Emma Susannah Bishop. Born 11-4-1843, died 11-23-1869 - Son of Simeon P. and Amanda L. (Lee) Howe, born in Bingham Twp. HOWE, Hulda (Tarbox). Spouse of Reuben N. Born 1872, died 12-16-1911. Age: 38 - Dau of Willis & Rose (Shutt) Tarbox. Wed in 1896. HOWE, Jay Valorus. Spouse of Mary Bissel/ Martha House. Born 3-11-1853, died 10-29-1924 - Son of William N. and Louisa (Dyer) Howe, born in Independence NY. HOWE, Louise H. Spouse of Phillip Burdette. Born 1928, died uncut - [Live within my love] Wed 4-16-1949. HOWE, Mary Marie (Smith). Spouse of Daniel C. Born 1822, died 11-17-1901 - Dau of David F. and Catherine (Kiser) SchmidtWed 5-23-1840 in North Bingham. HOWE, Richard Allison. Born 1-7-1923, died 10-5-1981 - Son of Louis F. and Hattie A. (Bassett) Howe, born in Allegany Co, NY. HOWE, Rufus H. Spouse of Caroline Ainsworth/ Luthera Bishop. Born 1-7-1823, died 4-18-1905 - Son of Isaac and Betsey (Buck) Howe. Wed Caroline 1-1-1845 in Lansing, Tompkins Co NY. Wed Luthera 9-16-1855 in Independence, Allegany Co. NY. - Civil War Vet, Co E 99th PA Vols, Pvt. Drafted, fought at Petersburg, witnessed Lee's surrender at Appomatox. Mustered out with company on July 1, 1865. HOWE, William Nelson. Spouse of Louisa Dyer. Born 3-10-1829, died 7-5-1865 - Son of Isaac and Betsey (Buck) Howe. Wed 9-3-1849 in Andover NY. - Civil War Vet, Co F 99th PA Vols, Pvt. Drafted - mustered out with company on July 1, 1865 - burial record - died at Philadelphia, Pa on July 5, 1865. JONES, Lydia. Spouse of William H. Born 1-1841, died 1904 - 1900 Bingham Census: 1843. William buried in Mills. KENDERDINE, Alvin R. Spouse of Mary Jane Iliff/ Rose Hand. Born 11-8-1939, died 9-14-2014. Age: 74 - Son of Stanley E. and Pearl (Hoagland) Kenderdine, born in Holland PA. Seven children with Mary. 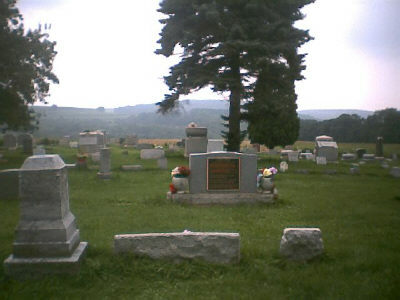 Wed Rose 9-22-2001 in Croydon PA.
KIBBE, Dorothy Church (Fuller) [Dolly]. Spouse of George W. Born 1844, died 1904 - [His Wife] Dau of Charles and Harriett Fuller, from New Hudson NY. 1900 Bingham Census: Wed to George 28 yrs, three children. KIBBE, James. Spouse of Dorcus Brown. Born 1814, died ?? KING, Amos Clinton. Spouse of Elsie L. Howe. Born 2-21-1841, died 11-29-1914 - Son of William and Mary (O'Neil) King, born in Venango PA, Wed 1-21-1871 in Ellisburg PA> - Civil War Vet, Co F, 121 PA Vols, Pvt. Discharged by Special Order on April 1, 1863. KING, Elsie Lucina (Howe). Spouse of Amos Clinton. Born 8-19-1845, died 2-14-1901 - Dau of Daniel C. nd Mary M. (Smith) Howe, born in North Bingham. Wed 1-21-1871 in Ellisburg. KNAUER, Elnora (Johnson) Ransom. Spouse of Howard E. Ransom/ George Knauer, Sr. Born 9-3-1919, died 3-22-2012. Age: 92 - Dau of Rufus and Helen (Shutt) Johnson, born in Bingham Twp. Three sons with Howard. Wed George after 1959. LEBAR, Richard C. Spouse of Mary Patterson. Born 4-1844, died 1925 - 1900 Bingham Census: 1845 - Civil War Vet, Co B 189 NYS Vol. LEET, Mary F. (Littlefield). Spouse of Walter S. Born 1-6-1918, died 3-29-2003. Age: 85 - Dau of Lafe and Fannie (Dodd) Littlefield. Born in Coudersport, PA d. Sayre, PA. Co-owner/operator dairy/produce farm in Allegany Twp. LEETE, Eliza A. Spouse of Franklin P. Born 1844, died 1924 - 1900 Allegany census gives birthdate as 11-1848. LEETE, Franklin P. Spouse of Eliza A. Born 1845, died 1916 - (1880 Bingham Census) 1900 Allegany census gives birthdate as 4-1848. LEETE, Norman J. Spouse of Thera H. Born 1862, died 1931 - Son of Timothy J. and Samantha (Lewis) Leete. LEETE, Rosell H. Spouse of Katherine Palmatier. Born 1894, died 1952 - Wed 2-12-1920. LEETE, Ruth Amanda. Born 8-10-1899, died 10-4-1918. Age: 19y 2m - Dau of Norman J and Thera H Leete. Died in Washington DC of the flu. LEWIS, Della (Carpenter). Spouse of Fowler. Born 1865, died 1884 - Dau of Ira B. and Mary A. (Baldwin) Carpenter. LEWIS, Levi B. Spouse of Sarah Ransom. Born 05-22-1837, died 07-27-1883 - [Gone but not forgotten] Son of Amos R and Bethiah (Carpenter) Lewis. Was Potter Co Auditor and Postmaster. Wed 5-9-1859. (1850 Bingham Census) - Civil War Vet, Co G, 53rd PA Vols, Pvt. LEWIS, Sarah (Ransom). Spouse of Levi B. Born 08-25-1835, died 06-02-1889 - Dau of George and Eliza (Burt) Ransom. Born in Bingham Twp. Wed 5-9-1859. MATTISON, Sarah (Carpenter). Spouse of Dr. Edgar S. Born 1848*, died 02-03-1870. Age: 22 - Dau of Ira B. and Mary A. (Baldwin) Carpenter. MCCARN, Sylvia (Howe). Spouse of Lyman McCarn/ Harrison Mourhees. Born 2-7-1851, died 1-22-1922 - See Mourhees, Harrison. It is unclear where she is buried. MCELROY, James Clinton. Spouse of Angie Clarke. Born 11-14-1862, died 7-2-1905 - Son of James and Anna (Boyd) McElroy. MERRICK, Gusta S. Spouse of Eugene. Born ? ?, died ?? MERRICK, Jennie Budd (Maye). Spouse of James V. Born 1884, died 1942 - Dau of Addison C. and Genette (Ryan) Maye. MULFORD, Carrie (Henry) Holbert. Spouse of James E. Born 1882, died 1908 - Dau of John and Susan A. (Thompson) Henry. NELSON, Ione (Briggs) Frances. Spouse of Sherman Frances/ Rodney. Born 1869, died 1948 - [His Wife] Wed Sherman 8-20-1890. Wed Rodney 3-31-1903 at Independence NY. ORDWAY, Ethel (Tracy). Spouse of Leon J. Born 12-29-1934, died 3-2-2017. Age: 82 - Dau of Dana and Ethel (Rogers) Tracy. Born in Little Marsh PA, lived in Whitesville NY, died in Wellsville NY. Wed 3-13-1954 in Whitesville, five sons. ORDWAY, Leon J. [Jack]. Spouse of Monica Miles. Born 10-2-1957, died 7-13-2017. Age: 59 - Son of Leon J. and Ethel (Tracy) Ordway. Lived in Whitesville NY. Volunteer fireman for 37 years, Worked 38 years for Herbert Cooper Co. in Genesee PA. Wed 7-25-1987, two children. ORDWAY, Patricia (Schweigart). Spouse of Richard L Pratt/ Richard G. Born 5-2-1934, died 12-31-2003. Age: 69 - Dau of Albert J and Ida E (Clark) Schweigart. Wed Richard Pratt 11-20-1951 in North Bingham, 5 children. Wed Richard Ordway 2-22-1997 in Whitesville NY. RAYMOND, Jane (Searle). Spouse of Joel L. Born 8-15-1817, died 10-22-1838 - [Wife of] 1st wife of Joel. RAYMOND, Joel Lyman. Spouse of Jane Searle/ Matilda Grover. Born 3-2-1812, died 3-12-1913 - Son of William G. and Betsey (Freeland) Raymond. Born in Berkshire Co MA. Wed Jane 11-1-1837 in Berkshire Co MA. Wed Lydia 1-29-1840 in Bingham Twp,. (1840 Bingham Census). RAYMOND, Joel R. Born 3-17-1882, died 07-18-1884 - Son of John and Mary Raymond. ROBBINS, Earl S. Spouse of Neva D. Ransom/ Kate Ransom. Born 1884, died 1966 - (1900, 1910 Bingham Census) Neva and Kate were sisters. ROBBINS, Eleanor (Payne). Spouse of Mason J. Born 4-4-1924, died 3-31-2016. Age: 91 - Dau of Clarence and Esther (Bennett) Payne, born in Corning NY. Wed 7-26-1953 in Westfield PA, three children. ROBBINS, Frank T. Born 3-8-1874, died 1896 - Son of Marshall K. and Celinda (Smith) Robbins. ROBBINS, Neva D. (Ransom). Spouse of Earl S. Born 4-1886, died 1907 - Dau of John R. and Emily (Patterson) Ransom. (1900 Bingham Census) Also, see Slawson, Emma, this cemetery. ROHRER, Sonja (Hall). Spouse of #1 Carl S. Pratt, #2 Alvin K. Rohrer. Born 11-1-1947, died 11-24-2004. Age: 57 - Dau of Stewart G. and Onnolee (Truax) Hall. Born in Coudersport, a factory worker. Wed Carl 1965, two daughters. Divorced. Wed Alvin 7-4-2002 in Sweden Valley. ROOKS, Ezekiel. Spouse of Ada Wiley. Born 1835, died 1923 - Son of Daniel Jr. and Delana (Boldman) Rooks. Born in PA.
ROOKS, Flora (Stillman). Spouse of Lyman H. Born 1857, died 1933 - 2nd wife of Lyman H. Rooks. SCHWEIGART, Ruth (Dexter). Spouse of William Addison. Born 6-9-1939, died 3-11-2004 - Dau of Fred C. and Mabel (Hart) Dexter, born in Blossburg PA. Wed 12-20-1956 in Harrison Valley, 4 children. SCHWEIGART, William Addison. Spouse of Ruth Dexter. Born 10-3-1932, died 5-27-1999 - Son of Albert J and Ida E (Clark) Schweigart. Wed 12-20-1956 in Harrison Valley, 4 children. - Korean War Vet, US Army, Pvt. SCOVILLE, Rhonda (Humphrey). Spouse of Jessie. Born 1784*, died 11-01-1861. Age: 77 - Rhoda or Rhonda?? SCOVILLE, S. Gilbert. Spouse of Theodosia Austin/ Ruth Horten. Born 4-23-1816, died 04-03-1890 - Son of Jesse and Rhoda (Humphrey) Scoville. Born in Cornwall CT.
SPRINGER, Alfred. Born 1920, died 9-15-1928. Age: 8 - Son of Nelson and Mima (Grover) Springer. SPRINGER, Frank. Spouse of Mary Louise Shaff. Born 8-19-1866, died 4-1-1942 - Son of Nelson and Mima (Grover) Springer. Wed 1-9-1902, 7 children. SPRINGER, Grant. Born 1907, died 1952 - Son of Nelson and Mima (Grover) Springer. SPRINGER, Mary Louise (Shaff). Spouse of Frank. Born 1880, died 6-13-1926. Age: 45 - Wed 1-9-1902, 7 children. Tuberculosis. SPRINGER, Nelson. Born 1909, died 1912 - Son of Nelson and Mima (Grover) Springer. STEVENS, Katherine D. (Schweigert). Spouse of Ivan R. Born 6-2-1937, died 10-4-2008 - Dau of Albert J. and Ida (Clark) Schweigart. STONE, Lester. Spouse of Sophia M. Born 1832, died 1900 - Civil War Vet, Co I 189 NYS Vol. also: Co G, 46th PA Vols, Musician. Discharged on Surgeon's Certificate, date unknown. TARBOX, Roseltha (Shutt). Spouse of Willis. Born 11-1851, died 1942 - [Mother] Dau of John and Lovisa (Kimball ) Shutt. (1870, 1900 Bingham Census: 1852. TEATER, Malissa (Carpenter). Spouse of Peter D. Born 01-25-1867, died ?? - Dau of Barber and Eleanor (Bronson) Carpenter. TOMPKINS, John N. Born 1839, died 1880. Age: 41y 8m - Civil War Vet, Co G, 153rd PA Vols, Pvt. UNKNOWN, Infant. Born ? ?, died ?? VERMILYEA, Madeline H. (Truax). Spouse of Lawrence C. Thompson. Born 2-8-1920, died 3-10-2013. Age: 93 - Dau of Stephen and Elsie (Robbins) Truax, born in Harrison Valley. Three children - surnamed THOMPSON and BEAN. WHITNEY, Eli E. Spouse of Hattie M. Born 6-1843, died 1914 - Son of Amasa and Isabelle Whtney. (1850, 1900 Bingham Census) 1900 Census: 1841.